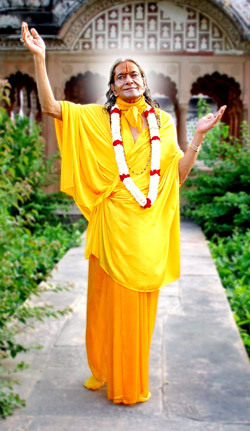 Jagadguru Shri Kripaluji Maharaj: Distributing Braj Ras..
frequently visited Mandaleshwer and Maheshwar and had nonstop nam sankirtan programe of mostly one to two weeks or even more in those places and also near the Narmada river. Once in Gopal Mandir in Mahu a 15 day's nam sankirtan was organized, but slowly it stretched up to 4 months.The devotees, everyday, had new devotional experiences. All the devotees of Maheshwar, MMandalshwar and Mahu were very close to Shree Maharajji like a family. You have to understand the kind and class of the Divine Bliss which Shree Maharajji is giving the magnitude of the Divine love he is revealing, and the extent of Graciousness which he is showering upon all the souls. when a devotee hears or reads that the ' Hari Bol' chanting of chaitanya Mahaprabhuji enticed even the wild beasts, he forms a great Divine image of that event. But when he sees the Bhao state of Shree Maharajji's 'Hari Bol' chanting his material mind fails to comprehend its Divine greatness beacause its Divine could only be experienced by a Divine personality and its devotional effects could be experienced a dedicated devotional mind to the extent of its purity and the understanding of its value. So, it is most important that a devotee should understand the Divine greatness of Shree Maharajji's satsang and chanting to receive its full benefit..